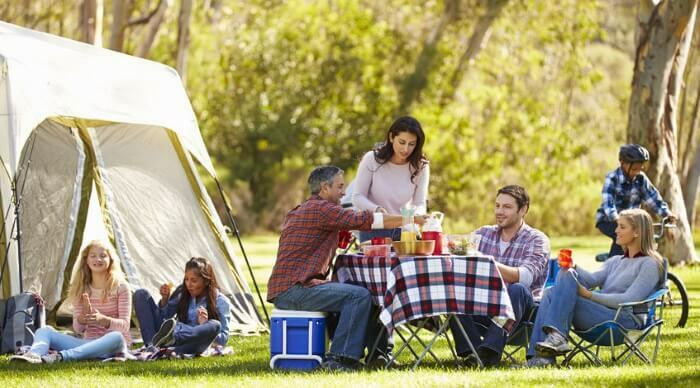 Pop up tents offer campers an opportunity to easily explore the great outdoors. As their name implies, these tents take minutes or even seconds to deploy and take down. In this article, we’ll take a look at some of the best pop up tents on the market. The beauty of pop up tents is that they leave more time for actual enjoyment of the woods, beach, or desert. And while older model pop up tents were pretty simple, new models have a lot of features that are often only seen on more expensive tents. We’ll cover the most important features to see if we can identify the perfect pop up for your next camping trip. We’ll also examine each one’s Pros and Cons. The main thing that separates pop up tents from the thousands of types of regular, garden variety tents is their ease of setup and tear-down. To do this, these tents usually feature “accordion” frames that deploy and fold up in seconds. They also often use minimal (or zero) tools, and pack up quite small to increase portability. The goal? Maximize simplicity, speed, and convenience. Of course, each brand or design of pop-up accomplishes this goal in its own unique way. To identify the pop-up tent that best suits your style, we need to consider some specific design elements. Below, I’ve listed some of the more important things to consider. How long the tent takes to set up is usually measured from the second you take it from its bag to the second you can unzip the door and step in. In some cases, the time is nearly “instantaneous,” while in others, you’re still talking a few solid minutes before the tent is ready to sleep in. Size, type, and capacity can be significant factors here, so you’ll need to consider all the factors below before coming to a conclusion. Does it fold up easily? Knowing how long it takes (and how easy it is) to tear down a tent and hit the road is often as important as the setup time. You also want to know if people of various sizes and ages perform the tear down without help. Additionally, you should be aware of the size of the tent once folded up and packaged. This will help you know how easily it can be traveled with. One of the best things about pop up tents is that they usually don’t need any extra equipment to set up. This makes the entire tent package quite light – perfect for long romps through the woods or desert. Still, just how light a tent feels depends a lot on the person carrying it. Be sure to consider the weight of the unit before making a buy. This is a factor you’ll want to consider with any tent – pop up or otherwise. The great outdoors is outdoors, after all. Will too much sun damage weaken the material? You’ll also want to know how waterproof it is as well as how it will tolerate high winds. Some people don’t mind a low tent, as it’s easy for anyone to pack up when the fun is all done. Others want a tent they can stand up in. Any added height can affect the other factors I’ve mentioned, like time to set up and tear down. Pop-up tents are usually on the less expensive side as far as camping equipment goes. Still, how inexpensive can something get before it becomes downright “cheap?” Tents should be durable, and able to handle almost anything Mother Nature throws at it. Is the material strong? Is the manufacturer reliable? Are there any warranties or consumer protections in place? The Coleman 2-person pop-up tent is a perfect example of a simple, easy-to-use product. Yet, that by no means implies that it is perfect. Small, light, and able to be set up in roughly ten seconds, the Coleman folds completely flat, into a circular shape that can then fit into a storage bag. When flat, it is approximately 2-3 feet across, perfect for lying down in a truck bed or fitting into any car. The tent features a fire and water-resistant rain fly cover for added protection against the elements. Speaking of the element, though this little tent is quite small, it is able to resist powerful gusts without collapsing. It also has some Coleman-specific features. Many of these have become standard on some of the company’s more expensive tents. These include integrated storage pockets and inverted seams to decrease leakage. It also has pre-assembled poles that pop into place upon deployment. Still, this tent is not only quite small but, at only 3′ in the center, very low. It will fit two people max, and even that might not be as comfortable as users would like. There are also reports that the rain fly doesn’t cover enough of the top to make it waterproof in heavy rain and wind. Al in all, the Coleman 2-Person Pop-Up Tent should offer campers a budget conscious, easy-to-use product. Providing weather is on their side, and they don’t mind an “up close and personal” experience, this tent should fit the bill just fine. The Gazelle 22272 T4 Pop Up is one of the few tents that offer headroom to even height advantaged people. At 78” tall (6’5) and with 61 sq. ft of floor space, this is a spacious tent that should easily sleep up to four people quite comfortably. The manufacturer claims the Gazelle Camping Hub can be set up in 90 seconds. This is largely thanks to the fully-integrated fiberglass poles. All you need to do is insert the poles into their corresponding slots and pop up the roof. Another feature is the detachable floor. This allows you to shake out dust, dirt, or sand that manages to get in. There are also six different mesh windows to maximize ventilation. A nice high tent will be an advantage to most. Still, some shorter users may find the mechanism for folding the tent to be too high for them. Others have complained about the size of the tent when folded up, as it is nearly 6′ long. This, combined with the fact that the unit weights about 30 lbs, makes it a little bulky to carry out in the woods. This is an excellent choice for those who want a pop-up tent with a bit more space to move around. The tent is quick to deploy and boasts many unique, innovative features. This makes it the perfect choice for those more concerned with comfort than budget. The fact that it is heavy and a bit expensive are forgivable. The Instant Setup Cabin Tent is one of the largest pop-up models on the market. According to Coleman’s specifications, it can sleep a whopping 10 people and be set up in just one minute. The Instant Setup Cabin Tent is unique in other ways as well. It utilizes “dark room” technology, which blocks out “90% of sunlight.” This will allow you to sleep past dawn while reducing the temperature inside the tent. The tent also features the patented Weathertec System. This includes “welded” corners, a tub-like floor, and protected seams to keep water out. As for measurements, the Cabin Tent is 14′ by 10′, with a center height of 6’7. This is perfect in case one of your ten people is on the tall side. For added privacy, there is a divider to turn the single room into two. As there is no rain fly, leaking has proven to be the primary problem with this unit. On top of that, sometimes condensation can form inside the tent as well. Other complaints include the general bulk of the tent. This refers to the fact that it weighs in at 50 lbs when folded into the carrying case. If you need a pop-up tent that will fit ten people, your options are going to be limited right off the bat. While heavy and pricey, there’s really no reason to expect a tent like this NOT to be. The features are great – especially the “dark room” technology. So as long as it can keep Mother Nature out, it should please most purchasers. The Night Cat Pop Up Camping Tent is one of several models to embrace a “hydraulic pressure mechanism.” This supposedly speeds up deployment and tear down. In this case, the manufacturer claims setup takes one minute while tear down takes two. Still, there have been reports of this model being hard to deploy, as it comes with little to no instructions. For the price, it’s nice that the Night Cat is roomy enough for two to three people, even though it lists four as the max. Its mesh windows and double doors should help keep it cool in the summer heat. Also, the 210D oxford tent fabric should provide nice protection against the elements. One cool feature is the rain fly, which can be set up as a pavilion without the tent. Looking closer, there are some suspicious things about the Night Cat. First, the manufacturer warranty specifically mentions the automatic mechanism failing. It uses the excuse that it is “not meant to for use in heavy rain,” which seems a bit odd. The package also comes with an electric bug zapper racket as a free gift. Regardless of the wording in the warranty, the reports on this tent seem to be mostly positive. And why not? It’s cost-effective, lightweight, and quick to set up and tear down – everything a pop up tent should be. The Toogh Pop Up Camping Tent is another product to feature automatic deployment. In this case, the manufacturer claims the tent can be set up and taken down in roughly one minute. Toogh is unique in that the company is very concerned with customer satisfaction. As the company offers 24-hour customer service and a 12-month satisfaction guarantee, buying the Toogh is very safe. The manufacturer also claims that their six-angle design is more stable in the wind. Other features include anti-wind ropes, a detachable rain fly that can be set up on its own, and poles to create an entryway. There is one significant downside to the Toogh – its size. While the specifications claim to fit four people, most say the tent maxes out at two. Along with the potential failure of the automatic mechanism, this is cause for concern. The Toogh combines some of the most unique features and benefits at this price level. By all accounts, it is durable, reliable, and easy to carry from place to place. The only problem is that it doesn’t hold more people, as the manufacturer claims. We’ve analyzed the Pros and Cons of our Top 5 best pop up tents. We now know that each one is designed for its own type of user. Considering needs and budget, users can determine which model is best for them. In our opinion, any of these items would make a great buy. Of course, it should meet your own standards and expectations. For quick and easy access to the great outdoors, there’s no better tool to have at your disposal than a good pop up tent.